It’s one thing to trek in a desert, and it’s quite another to pose in front of the camera after that and not look like a hot mess. Four celebrities didn’t just pick up that gauntlet – they threw it out of the park. Global fashion icon Chiara Ferragni, South Korean national boxer Lee Siyoung, Japanese starlet Kasumi Arimura and Chinese actress NiNi strapped on their hiking boots to cross some of the most extreme and beautiful corners of the Earth. It’s part of a SK-II campaign titled SK-II: 'Face the Wild, Face the Camera' Extreme Expedition Series, produced by National Geographic. Comprising a series of documentary-style videos, the campaign follows these celebrities as they journey through four stunning yet harsh locales: California’s parched Anza Borrego desert, Indonesia’s active volcano Ijen, Japan’s dense Yanbaru jungle and northern China’s frozen mountain range. The mission? To subject their skin to extreme weather conditions before strutting for a glamorous photoshoot by star fashion photographers Jesper Mcilroy and Kirk Cheung. And their (not-so) secret weapon to withstand the test: a bottle of SK-II Facial Treatment Essence. Pitera, the key ingredient in the Facial Treatment Essence, contains over 50 micro-nutrients that helps condition skin, locks in moisture from within, and alleviates skin problems caused by dryness, UV rays and pollution, among others, to keep your face crystal clear – both on the road and at home. 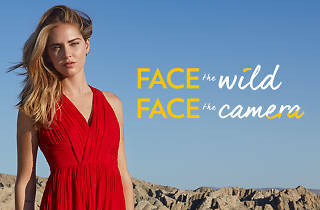 Watch the SK-II: 'Face the Wild, Face the Camera' Extreme Expedition Series trailer here.